There is no gate or decorated signboard at Phaung Daw Oo Integrated Monastic Education School (PDO) in Mandalay, and its entrance obscured by advertising billboards, tuk-tuks, and motorcycles. A pedlar stands guard at the corner, enticing passing students to try their luck at a game of spin-the-wheel, while vendors line the alley leading up to the school, selling Burmese noodles, snacks, and other daily items and oddities. For the moment, the area is relatively clear, but when the bell rings to mark the end of the school day, everything becomes a blur as a sea of bicycles and students in white and green sweeps across the compound. This is Myanmar’s largest monastic school, with close to 10,000 students and 500 teachers and staff. It is one of the few monastic schools accredited to offer education from kindergarten to high school, and is perhaps also the most progressive in the country. PDO was founded in 1993 by its principal, Sayadaw U Nayaka, and his brother Sayadaw U Jotika, who were both inspired by Christian missionary schools and their idea of free education, a legacy of Myanmar’s colonial past. From its humble beginnings, PDO has had only one mission: to provide free tuition to students from impoverished backgrounds, orphans, neglected and abandoned children, and those otherwise unable to attend government schools. Children are admitted regardless of religion, race, or gender. Free room and board is provided for about 1,000 students and staff. Many of the resident students come from remote areas where there is no school, or where civil war or natural disasters have made access to education difficult. In addition to the majority Bamar people, there are several ethnic minorities attending the school, including the Akhar, Kayin, Larhu, Pa-oh, Palaung Kachin, Shan, and Wa. There are also 400 orphans housed in one dormitory, and a full-time health clinic providing free medical treatment for the students and staff alike, treating an average of 150 students a day. PDO is also home to some 700 young Buddhist novice monks and nuns. While only a few of these will enter religious life full-time, for now their day begins with the ritual collection of alms from the neighborhood. After breakfast, they attend classes together with the other students. Pali language and Buddhist studies lessons are conducted after regular school hours. 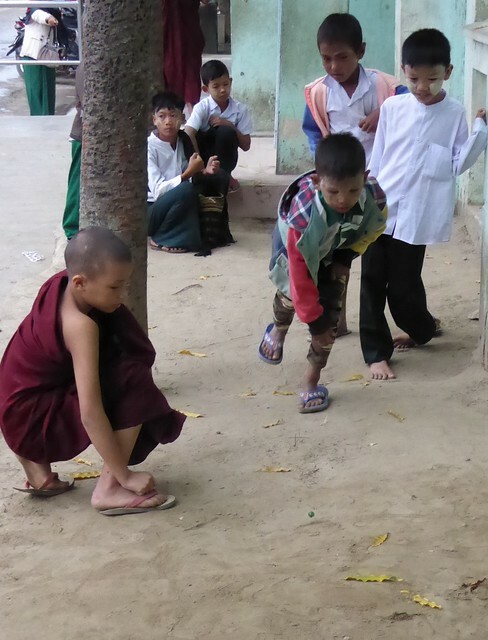 What distinguishes PDO from traditional monastic schools in Myanmar is its rejection of the traditional emphasis on rote learning and memorization that has retarded Myanmar’s education system for decades. Instead, PDO stresses a holistic and child-centred approach (CCA) to education. With the help of donors, U Nayaka sought foreign teachers to conduct training at PDO, and many of the school’s young teachers have themselves gone through the CCA system as pupils. As such, they are better able to grasp its pedagogy during the intensive training and have little difficulty applying the methodology in the classroom. CCA is used in kindergarten and primary classes, while the middle and high school levels use the Reading, Writing, and Critical Thinking (RWCT) method. Classes are taught mainly in Burmese, although many students speak other languages at home. There are special programs, such as Fast Track, Bridging, Pre-College, and New Teacher Training, which are taught in English, and students are also encouraged to attend classes in life skills, leadership training, health, hygiene, gender, and citizenship. Sunday Dhamma school, which teaches basic Buddhism and ethics, is optional and open to all children in the neighborhood. Although CCA is highly valued, its emphasis on creative and critical thinking is ill-matched for Myanmar’s existing examination system, which is still based on textbook memorization and regurgitation. As a result, students trained through CCA do not always stack up against students from government schools in examinations. Only 30 per cent of PDO’s students passed the matriculation exams in the 2014–15 academic year, and only 185 obtained distinctions. Those who do pass the final examinations face an uphill battle to gain entry into university, with places usually awarded according to examination marks. Once admitted, many cannot find places in preferred subjects such as medicine, engineering, or information technology, which require very high total examination scores. One of U Nayaka’s main concerns is what will happen to the children after they leave PDO. “Most of them come here because they can’t afford tuition fees. Some of them can’t go to those universities because of their marks, but they are smart enough to become professionals,” he said. To provide opportunities for these students to further their education, PDO is experimenting with pre-college classes aimed at preparing students and teachers who will go overseas to study. On a more practical level, students can opt for vocational training, which includes carpentry, tailoring, computer studies, horticulture, and catering. Many of these classes also help to lower the school’s expenditure and even generate income. For example, school uniforms are made in the sewing classes, while the carpentry class builds furniture and undertakes much of the construction work at the school that would otherwise have to be outsourced. Produce from the horticulture program, meanwhile, is used to feed the multitude of students through the school’s dining program. Education can be a great equalizer in lifting poor and disadvantaged communities out of poverty. For most, their options lie in the government or monastic systems. The latter, in particular, plays an important role in providing education for many unable to access government schools. Yet it is not only access, but the quality of education that matters. To achieve a more egalitarian society, no single factor is more important than investing in quality education. Sadly, too many government and monastic schools remain stuck in a bygone era, providing a low quality of education and working with inadequate resources. Very few abbots and teachers have experience in school management, and hold only a basic understanding of education principles and the developmental needs of children. There are an estimated 1,579 monastic schools with 7,500 teachers nationwide to meet the needs of some 275,000 students. *** To improve monastic education throughout Myanmar, the Monastic Education Development Group (MEDG), led by U Nayaka under the umbrella of the PDO, was established in 2012. With his influence, U Nayaka successfully lobbied for recognition of monastic schools at the policy level, such as the inclusion of monastic schools in the Ministry of Education’s school grant policy. Since 2015, PDO has embarked on various IT initiatives with foreign partnerships to develop and position itself as the Centre of Information Technology for Monastic Education. The aim is that through the e-learning solution program, more children in remote regions will be able to access high-quality education through distance learning. U Nakaya’s broad vision and dedication has placed him in the top 50 finalists for the 2016 Global Teacher Prize,**** the only Burmese to make the list and an endorsement of PDO’s success. At 73, U Nayaka is still not quite ready to slow down. His latest project is building a new campus in the foothills of Taung Kyun Forest, and a monastic school convention to be held in May 2018 for more than 2,000 delegates from across the country at this new campus is already on his calendar. At the moment, with only a single bamboo hut, no electricity, and no proper road access to the site, this is, as one volunteer puts it, “an ambitious plan by any stretch of the imagination.” Given U Nayaka’s optimism and his unwavering resolution, almost nothing seems impossible! **** The Global Teacher Prize is a US$1 million award presented annually by the London-headquartered Varkey Foundation to exceptional teachers who have made an outstanding contribution to their profession.